since then he has resigned from the party that chose him and has been expelled from another party. 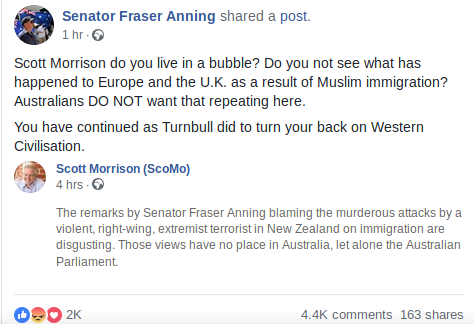 So he is trying to set up a new party called the Fraser Anning's Conservative National Party. Other parties are trying to block it's registration and his former home One Nation has already registered many web domain names to block his. His Facebook posting below has twice as many likes as hates. Tomorrow he is travelling to Melbourne again to agitate against immigrant African muslims. He is unlikely to remain a senator beyond the next election in a few months. Last time he got 19 direct votes but was appointed on the strength of support for the One Nation party block. He then left One Nation. Next time he will need about 240000 votes (almost 8%) to get a seat. It will be interesting to see how many he gets. The Prime Minister is running an anti immigrant campaign. There are a lot of racists in Queensland but there are several political parties trying to get their votes.